China’s implied demand in December was flat y/y at 12.16 mb/d, with slowing growth likely exacerbated by end-user destocking. Actual demand (adjusted for stock changes) was likely higher y/y by 0.20 mb/d. 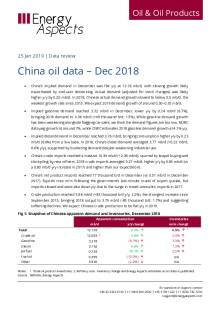 In 2018, Chinese actual demand slowed to below 0.5 mb/d, the weakest growth rate since 2013. We expect 2019 demand growth of around 0.30–0.35 mb/d. 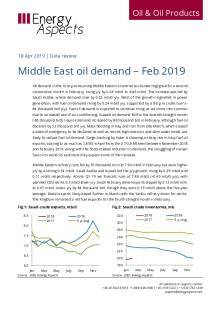 Implied gasoline demand reached 3.32 mb/d in December, lower y/y by 0.24 mb/d (6.7%), bringing 2018 demand to 3.36 mb/d (+49 thousand b/d; 1.5%). While gasoline demand growth has been weakening alongside flagging car sales, we think the demand figures are too low. NDRC data peg growth at around 7%, while CNPC estimates 2018 gasoline demand growth at 4.1% y/y. Implied diesel demand in December reached 3.76 mb/d, bringing consumption higher y/y by 0.23 mb/d (6.6%) from a low base. In 2018, China’s diesel demand averaged 3.77 mb/d (+0.23 mb/d, 6.6% y/y), supported by bunkering demand despite weakening industrial use. China’s crude imports reached a massive 10.34 mb/d (+2.38 mb/d), spurred by teapot buying and stockpiling by new refiners. 2018 crude imports averaged 9.27 mb/d, higher y/y by 0.85 mb/d (vs a 0.80 mb/d y/y increase in 2017) and higher than our expectations. China’s net product imports reached 77 thousand b/d in December (vs 0.51 mb/d in December 2017). Exports rose m/m following the government’s last-minute round of export quotas, but imports slowed and were also down y/y due to the surge in mixed aromatics imports in 2017. Crude production reached 3.86 mb/d (+83 thousand b/d y/y, 2.2%), the strongest increase since September 2015, bringing 2018 output to 3.79 mb/d (-65 thousand b/d; 1.7%) and suggesting softening declines. We expect Chinese crude production to be flat y/y in 2019.